Hello lovely lacquered ladies, hope you are having a wonderful day! My name is Becca and I blog over at Franken Femme where I specialize in teaching people to make their own polish. However, when Essie asked for guest posters, I jumped at the chance. Essie is seriously one of the sweetest most supportive people I've met since I've started blogging. So after my temporary fan girl moment after learning I would guest post, I sat down and thought about what to show you wonderful ladies. I love Essie's Friday Favorite with a Flair posts so I decided to do a Favorite with a Franken Flair Post! 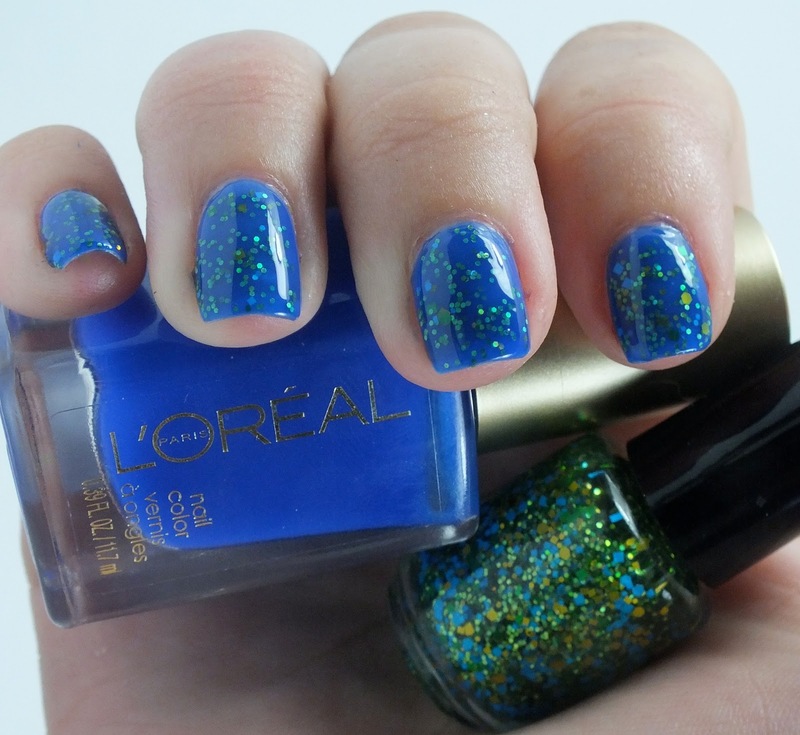 Today's star of the show comes from the recent L'oreal Miss Candy Gellie Summer 2013 Collection, specifically, Miss Pixie. 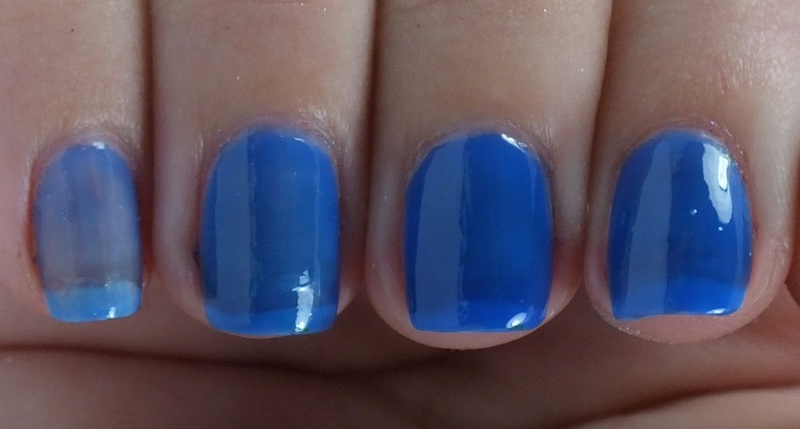 This polish is a gorgeous, vibrant, juicy, squishy, true blue jelly that dries to an awesome high shine. Pictured here is Miss Pixie from left to right at one coat, two coats, and the remaining two fingers have three coats. Even at three coats there is some VNL but nothing that bothered me too much. Just go ahead and pick your jaw up off the floor and be sure not to lick your screen, this thing is THAT delicious looking. Formula was pretty easy to work with, didn't pool, and self leveled well. Dry time was pretty average. Now, onto the Franken Flair! 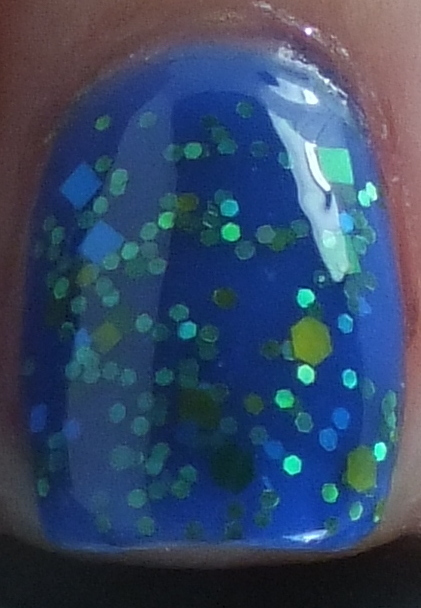 To try and insert my own little spice into this mani, I decided to do a jelly sandwich using a super simple franken glitter topcoat I made using .008 size lime holo hexes and the Sour Candy Mix (which is a mix of matte blue, green, and yellow hexes and squares) from YouMix Glitters mixed in some suspension base. I loved the finished look of this mani. Green, yellow, and blue always play well together and this was no exception! Well that's all for this mani, jelly sandwiches are ridiculously easy and always look awesome :) Thank you again to Essie for letting me guest post and I hope to see everyone around soon! However, until I do, remember to always keep it classy and creative! If you would like to purchase any of the supplies I used to create my glitter topcoat polish, they can be found here: * Suspension Base: TKB Trading www.tkbtrading.com * .008 Lime Holo Hexes and Sour Candy Mix: You Mix Glitters www.shopyoumix.com.